I’ll start my post with a quote from Oprah Winfrey, “Real Integrity is doing the right thing, knowing that nobody’s going to know whether you did it or not.” In life, we are often faced with challenges such as meeting people and stakeholder’s demands. This creates a complicated situation in which some people will do certain things just for the sake of satisfying the majority but going against their personal values and beliefs. In my over 24 years in the workforce, I’ve seen a myriad of things that people do just to make things happen. Some people do whatever it takes to get it done, like doing it at all costs. These sacrifices at times affect people’s life as they have to give up a lot to get things done. But just like anything else, you’re only as good as your current performance. Prior performance is often forgotten; sadly yes, that is the reality we live in. Furthermore, we see heads of public organizations and government figures getting in trouble because they did something they should not be doing. This is also pervasive in the athletic world, where some athletes think they are above the law. In sports, it is often a challenge when coaches focus so much on wins that it becomes the be all end all. When win becomes a measure of success instead of learning the skills to get better and improve future chances. Because of the need to win, players at times play hurt or the coach will put in players who are hurt. In doing so, you could sacrifice the future of the player. In recent weeks, I’ve faced the same situation, my team was off to a slow start and our shots were not falling. In addition, my strategy was not working, coupled with one of my best player being injured. A few days after the injury, we had another game. I thought about playing her since she was available. In the end before I drove home from work, I made a decision to seat her. As it turns out, our opponent never showed up and I ended up asking my team to have a scrimmage. As I look back at that situation, what helped me make the decision was to think about the long term health of my player. I’d rather take a hit now than to risk my player having a further injury. It goes back to doing the right thing regardless of the situation. I’m thankful for the opportunity to be challenged and came out with an experience that further strengthens my commitment to doing the right thing. 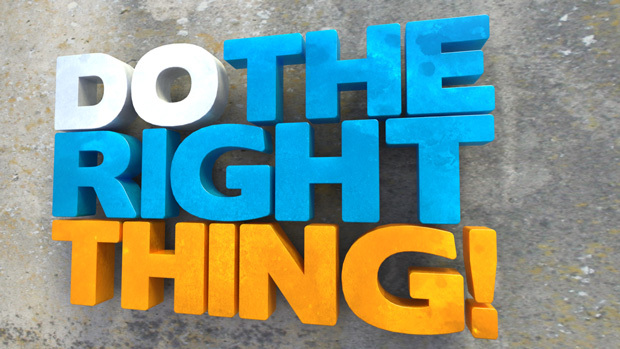 As Ms. Winfrey says, doing the right thing is doing it regardless of anyone looking at you. In essence it is a commitment that makes sure you stay true to your core values. Writing is a labor of love, if you like my post, please share with other. If you don’t agree, let me know your viewpoint as I can always learn from you.